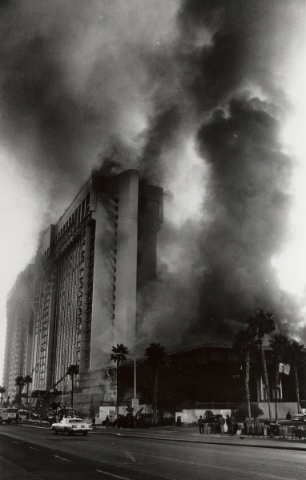 35 years after the MGM fire, are we really safer? It was shortly after 7 a.m. on Nov. 21, 1980, when a plume of smoke emanating from the Las Vegas Strip could be seen by residents throughout the valley. It was shortly after 7 a.m. on Nov. 21, 1980, when a plume of smoke emanating from the Las Vegas Strip could be seen by residents throughout the valley. The 26-story MGM Grand Hotel (now Bally’s), had caught on fire, leaving 5,000 guests trapped in the tower. The fire was the second-worst hotel fire in U.S. history, resulting in 87 deaths. Eight of the deaths were from burns. The rest — along with 700 injuries — were the result of smoke inhalation. That infamous day 35 years ago brought about changes in the way high-rise buildings were designed and built and how all commercial buildings are to be protected from fires. But are high-rises safe today? According to Gregory Fehr, a Las Vegas-based corrosion specialist and principal of ATMG Nevada, we may be living with a false sense of security. When the original 26-story MGM Grand Hotel opened in 1973, it was the most lavish hotel on the Strip. But, according to survivors, there were no alarms or sprinklers to alert the guests, most of whom were asleep in their rooms, to the fire. After a review of the architectural plans for the hotel, despite the urging from a former fire inspector at the time, the hotel was constructed according to building codes adopted in 1970. There was no requirement to install sprinklers or smoke alarms above the second floor. And when the codes were updated in 1978, hotel owners were not required to bring the hotel up to the current standards. However, shortly after the MGM fire, the Nevada legislature passed one of the toughest fire codes in the nation and sprinklers would be required in all hotels both old and new. The MGM fire started in a small snack shop called “The Deli” and, according to estimates by officials, crossed the entire casino (the length of a football field), in less than 20 seconds. Even though the flames never went above the second floor and were quickly contained, the smoke continued to spread quickly throughout the tower. The subsequent investigation showed the tragedy could have been prevented had the hotel been required to install a sprinkler system inside The Deli restaurant. Though both the fire marshal and a risk management consultancy hired by MGM had urged spinklers, hotel executives resisted. Clark County officials eventually granted the MGM an exemption because the restaurant was to be open 24 hours a day, and thus an employee would be on hand to notice any fire, sound alarms and combat it with fire extinguishers. However, in 1980 the restaurant was no longer operating round the clock and was unoccupied when the fire broke out. The cost of the sprinkler system would have been around $190,000. The lack of fire sprinklers, which only react to heat and would not have been activated in the rooms, was not a major factor. But smoke alarms would have alerted the sleeping guests. And several other building practices that have now been revised, contributed to the deaths during this catastrophic event. The smoke spread through stairways, elevator shafts, corridors, and ventilation equipment and the high-rise towers acted like giant chimneys. The air conditioning units on the roof were not equipped with smoke detectors, and so they continued to operate, recirculating the lethal smoke back into the building. The stairwells that could be opened from the hallways were locked from the stairwell side for security reasons and did not go to the roof. When some of the guests tried to escape down the stairs, they became trapped in the stairwell that filled with smoke. In addition, the seismic expansion joints provided a clear path upward for the smoke to travel to each of the guest floors. Once the rooms began filling with smoke, many of the guests began breaking exterior windows for fresh air drawing more smoke to the corridors and rooms. Modern building codes have changed the way expansion joints are designed, and requirements are in place for stairwells to automatically unlock during a fire or from a manual signal from the fire center, allowing complete access to and from the stairs during an emergency. Also, every fifth floor needs to be equipped with two-way communication devices. Air conditioning units now have sensors to shut them down in the case of a fire. 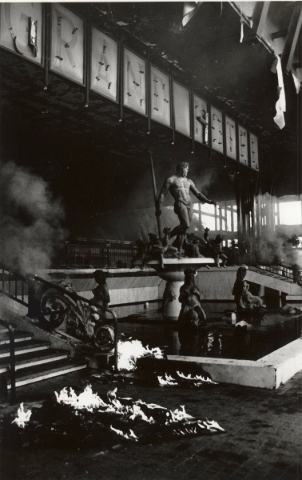 The former MGM was reconfigured with smoke barriers to prevent smoke from penetrating the building floor by floor or through openings such as laundry shafts, elevators, and stairways. Modern systems also confine and control smoke and use exhaust fans to vent it outside. Safety codes also require protective slabs between balconies to keep the fire from jumping from one balcony to another, and guest room doors must be rated to hold back a fire for 45 minutes. And that brings us back to the fire sprinkler system. Fire sprinklers are required in all commercial structures. They operate by heat sensors— a metal fuse or a red liquid in a glass tube, which holds a plug in place to keep the water that is under pressure from escaping. During a fire, the fuse or the red liquid expands with heat, breaking and allowing the plug to be pushed free by the pressure from the water. The water is pushed to a diffuser located on the bottom of the sprinkler head and sprayed around an area below the sprinkler head. Each sprinkler head is individually activated by heat, and not all of the sprinklers activate at the same time. However, according to Fehr, nine out of 10 sprinkler heads may not activate at all. Fehr, who has been randomly testing sprinkler heads for the past five years, has had a 90 percent failure rate on all tests. He points out that these are small samples, and not statistically relevant, but they provide some serious anecdotal information. The reason, he says, is corrosion build-up in the system. The water in a sprinkler system sits under pressure but can be stationary for years, except for occasional tests. During this time, microscopic bugs that live in the water along with the normal minerals found in the Las Vegas water cause a biological sludge to build up in the water. The sludge eventually finds its way to the lowest point in the system, which happens to be the vertical pipe that leads to the sprinkler heads. This sludge builds up in the vertical pipe and over time hardens forming a solid rock-like substance. When the sprinkler head is activated due to a fire, the sludge can effectively acts as a dam blocking the water from being expelled. According to Fehr, during testing, water pressure has been increased to five times above the normal required fire suppression system pressure before dislodging the sludge and allowing the water to do its job. Fehr has spoken informally about his findings to building and fire officials, but to date has not been invited to make a formal presentation. The MGM fire was a perfect storm of building code inadequacy, including the locking stairwells, oversized expansion joints, and decorative plastic trim in the casino that allowed the fire to spread so quickly and produce toxic fumes. With the code changes made since the fire and a little luck, we may be able to avoid future catastrophic events. But then again, it could be the microscopic things we ignore that could be the cause of another big event.